Creating a C Corporation is more complicated than forming a limited liability company or a sole proprietorship, but there are several tax benefits your company could enjoy. It is a brief guide for creating a C Corporation, which also is called a regular corporation. Please consult financial and tax advisers for more detailed information. A C Corporation is established with state authorities and must abide by corporate laws in the state where it is incorporated. Experts recommend that small-business owners establish corporations in their home states. Check which agency handles this in your state. The secretary of state's office often registers corporations. To form a C Corporation, you will need to register your business name, file a certificate of incorporation or articles of incorporation and pay a fee. You will also need to draft corporate bylaws and hold a board of director's meeting. Limited Liability: Owners are not personally liable for the company's losses or debts. Their investments in the company are their only financial risk. Tax Benefits: There are a number of tax benefits for a C Corporation. Depending on your business income, creating a C Corporation could lower your tax rate. No Pass-Through Entity: A C Corporation is the only business structure that is not a pass-through entity, which means your net income is taxed at the corporate level before it is distributed to the owners or shareholders, who must also pay tax on the income. 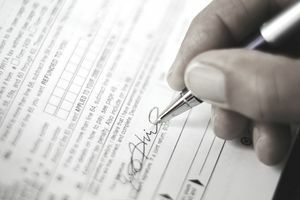 Small-business owners creating a C Corporation will have to file one of two forms with the IRS – one for their personal taxes, including income generated from the business, and another for their business. The business form will either be Form 1120, U.S. Corporation Income Tax Return, or Form 1120-a, U.S. Corporation Short-Form Income Tax Return. If your corporation reports an income under $50,000, you are only taxed at 15 percent. Individuals claiming that income through an S Corporation, a limited liability company or a sole proprietorship would have to pay much higher tax rates -- $4,386 plus 25 percent of the amount over $31,850 -- on their 1040 tax forms. Shareholders: Your C Corporation will include shareholders, and you can take the company public. You can also issue stock or stock options to employees. Longevity: The board carries on the company, not the owner. That means that a corporation can last longer than an owner-based company such as an LLC. Complexity: A C Corporation is complicated tax-wise and can be more difficult to create than a limited liability company or a sole proprietorship. You will certainly need financial, tax and business advisers to set up and maintain a C Corporation. Double Taxation: If you want to issue dividends to shareholders from your corporation's profits, the corporation will pay taxes on the profits and your shareholders will pay personal taxes on the dividends. If your shareholders are employees, you might be able to tax-shelter additional profits by providing better benefits such as dental and eye care in addition to standard health insurance. You can also raise salaries and give bonuses, which the company can take as deductions.